Matt Duffie, Jono Pryor and Gareth Huges with the bike custom painted by Mr G.
A registered charitable trust operating under the auspices of the Perpetual Guardian Foundation, is using one of the finest examples of automotive engineering and design to fundraise to support Kiwis suffering from mental illness. Wood for the Trees was founded in October 2017 by friends Gareth Hughes and Gareth Williams, with a mission to provide awareness and funding to grassroots organisations working in mental health and suicide prevention in New Zealand. 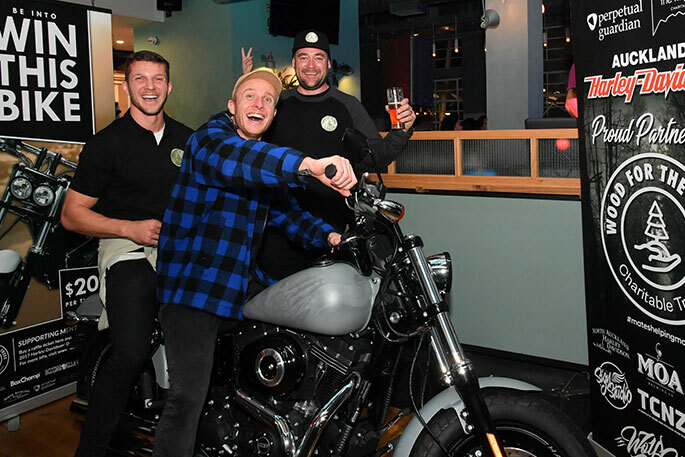 The charity is kickstarting its long-term funding drive starting with raffling off a 2017 Harley-Davidson Dyna Fat Bob motorcycle, custom-painted by talented Kiwi artist Graham Hoete (aka Mr G). The bike winner was Sandra Hutchens who is the mother of Timmy, who devastatingly took his own life and the reason Wood For The Trees was founded. Just an incredible result, serendipity. Gareth was the one who called her to says that her son had passesd away in March 2017. “Can’t see the wood for the trees” – the well-known saying refers to being unable to see a situation clearly because of overly close involvement or a fixation on small details. When mental illness means people can’t see the wood for the trees, Wood for the Trees wants to contribute to awareness, support and recovery. 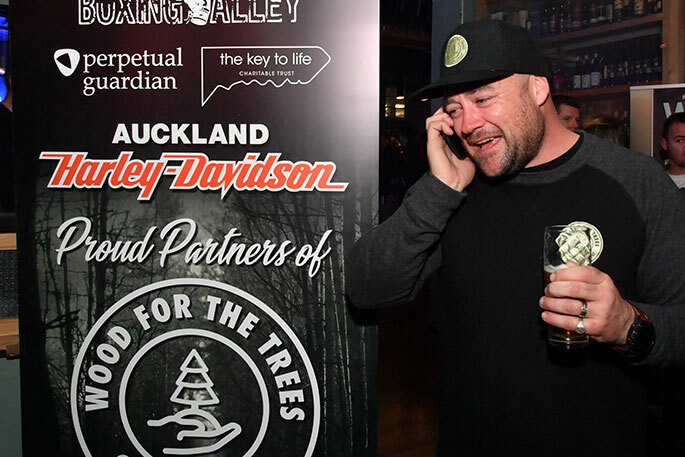 The first fundraising activity by Wood for the Trees raised $8000 for the community peer support group Key to Life; the current drive, inspired by the founders’ love of motorcycles and partnership with Auckland Harley Davidson, is expected to surpass $10,000, with the proceeds to be split evenly between Wood for the Trees and Key to Life. Gareth Hughes phoning the winner. Gareth says Wood for the Trees represents a collective determination to get something positive out of a tragedy and to make sure people are reaching out to their nearest and dearest to offer support and be there for them in difficult times. It’s also clear that the current public system isnt helping in times of crisis. “People are being let down and suicide numbers are on the up – the fact is, if you walk into a hospital and say you’re feeling suicidal, they can’t admit you unless you’ve made an attempt on your life. There are limited or no other places for people to go. "We’re also aware that while almost everyone is affected in some way by mental illness, those most at risk are men, more often they suffer in silence and don’t talk about how they’re feeling. “With Wood for the Trees we’re encouraging people to reach out, ask the tough questions if they think their mate or family member is having a hard time, research and access one of the many groups around the country that are there to help people with mental health needs. 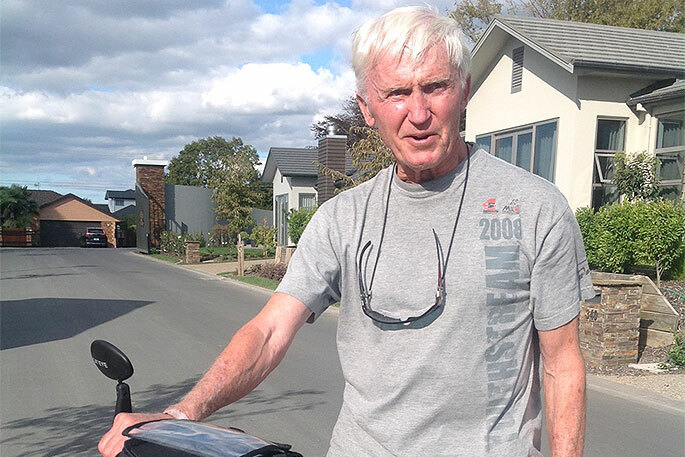 A major supporter of Wood for the Trees is Key to Life founder and ambassador Mike King, one of New Zealand’s most prominent mental health educators. He says of Wood for the Trees, “Every new boost of energy and funding and leadership we get for mental health awareness and suicide prevention saves lives and opens up conversations. Perpetual Guardian philanthropy manager Kirsten Taylor says the mission of Wood for the Trees, and the accessible, communal style of its fundraising drive, aligns perfectly with the vision and purpose of the Perpetual Guardian Foundation, which was established by Andrew Barnes to foster everyday philanthropy: that people give what they can afford to causes they are passionate about. Foundation contributors have several options, including giving to the Activation Fund to support innovation in philanthropy (donations start at $5 and there is no maximum amount) or starting their own sub-fund (like Wood for the Trees) to support a customised, long-term giving programme as an individual, duo or a group.